Right when my head hits the pillow, I'm typically out like a light. By the time I remember to put on some moisturizer, I'm usually far off into dream land. Unfortunately, my hands and lips tend to get quite dry and irritated, so remembering this step is very helpful. I've found two products which I have come to love applying, even when I'm on the brink of passing out. First comes L'Occitane Shea Butter Hand Cream. I have been blessed with naturally moist palms (gross, I know) but the back of my hands can be the exact opposite. Throughout the day, I wash my hands a lot and rarely apply lotion afterwards. If I do, it's always a small bottle of this exact L'Occitane cream, and I only put it on the back of my hands. It is extremely moisturizing and does not feel greasy. It works the best right after washing with warm water, since then it can actually lock in the hydration. This is a high quality product with good ingredients. Considering how little product it takes to sufficiently cover the hands, I definitely recommemd this hand cream. I also purchased the magic key, which allows you to roll up the metal tube as it is empties for optimal ease of squeeze. This cream can be found at some drugstores, department stores, Sephora and at L'Occitane stores. 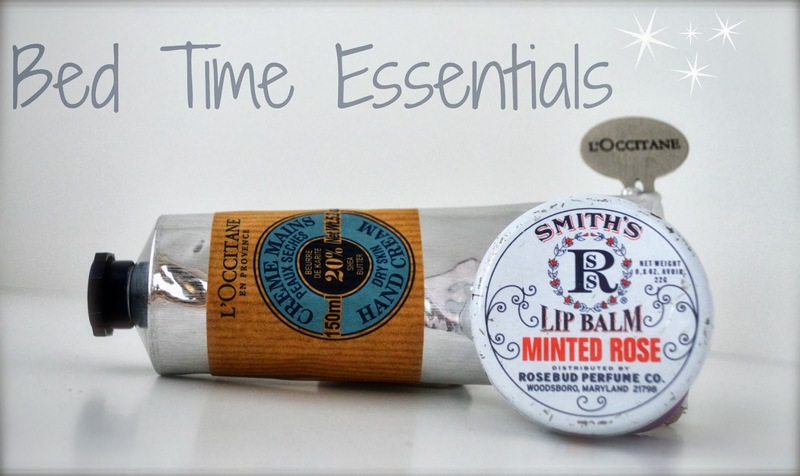 The next product is Smith's Minted Rose Lip Balm. Not only is the Smith's packaging adorable, but the products themselves are a great bang for your buck. I've tried the regular rose salve, the strawberry lip balm and this minted rose balm. At night time, I definitely prefer the mint. It isn't too greasy or sticky, and the light flavour is very tasty and fresh. If my lips are freling very dry, I will gently exfoliate with a lip scrub, wipe it off with a towel, then I'll apply some of this balm. In the morning, my lips feel soft and supple. Love it!